"Oh, East is East, and West is West, and never the twain shall meet," said Rudyard Kipling. Yet a new exhibition of photographs suggests otherwise--that, in fact, the East and the West met each other in surprising and profound ways during the Victorian and Edwardian periods. "Neither East Nor West - The Lafayette Collection: Asia in the Age of Monochrome," which runs through 10 September at the Islamic Arts Museum Malaysia in Kuala Lumpur, features 45 photographs drawn from the extensive Lafayette photo archive at the Victoria and Albert Museum in London. For more than two decades, the world's rich and famous trooped to 179 New Bond Street to have their portrait taken by James Lafayette, the most commercially successful photographer of the day. He photographed the most prominent people at court, in society, the arts, the armed forces, and the professions, as well as a stream of foreign visitors, from Japanese diplomats to African princes. The IAMM exhibit notes that "the sitters in the Lafayette photographs keep their identity while participating in a newly emerged global environment ... The late nineteenth and early twentieth centuries may have been oppressively ‘Victorian’ for many, but for the elite this was a time of openness and international understanding. The Lafayette Studio is a symbol of this dual role: a force that brought people from many parts of the world together for their mutual benefit." 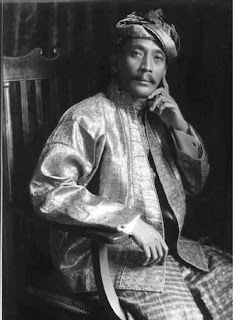 The exhibit's curators believe that this convivial mingling of the elite from East and West ("not only did they use the same photographic studio; they also attended the same events and often dressed in the same way") played a role in Malaysia's relatively peaceful transition to independence. Can't make it to Kuala Lumpur? The exhibition's catalogue is available online from the museum's shop. Hello Kristan. I'm Adline from Malaysia. I stumbled upon your blog, which is truly a great find. Hello Adline. Many thanks for your comment, and for letting me know about your blog. I plan to add it to my blogroll. Has the exhibition been well received? Hi again Kristan, thanks for adding me :) Yes, the exhibition is receiving positive response from the Malaysian public. Were u here to catch the show? Unfortunately, no. But I've used the Lafayette Collection at the V&A in my own research so am familiar with the many treasures it contains.